I have to admit I'm not usually a huge fan of cute, except when it pertains to babies.... and for that reason I'm perfectly fine with the adorable-ness factor that ramps up high on the craft scene at this time of year. All sorts of bunnies, chicks, lambs, and decorated eggs spring forth - yep, I'm a guilty participant... you've already seen my spring centerpiece and on Monday I'll have another bit of cute for you. All that said, I got a kick out of these rolled paper carrots at MarthaStewart.com because they're something different than the usual spring decor suspects. With very few necessary supplies, the life-size carrots look like a breeze to make quickly and simply from crepe paper streamers. Place a bunch (pun intended, ha) in a garden basket as a centerpiece or fill them with little toys and treats to give out as party favors. By the way, one of my quilling pals, Molly at It's Molly Smith, recently blogged three versions of mini-carrots that are pretty sweet too! Nice find Ann. These carrots look cute and so real to me. I saw Molly's versions of the carrots too, super cute. Cute carrots. Look quite real. Where do you announce the giveaway winners? I never seem to find. Thanks everyone - I'm glad you enjoyed the carrots. Hi Leeanne, I announce giveaway winners on the post itself; just scroll down to the bottom. Btw, I couldn't find a way to email you privately via your blogger profile or blog to let you know. I work too with crepe paper but carrots...very original. 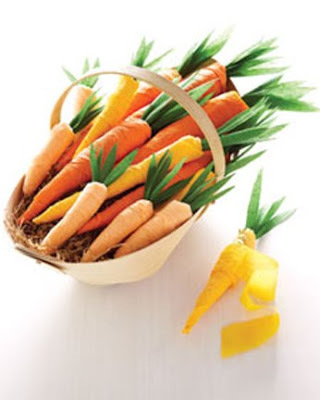 Carrots look as if they are real!!!!! That's actually cute. I'd done something like those carrots, but in a much smaller version! I put them in my miniature-sized basket, then put it all on an ATC. Check it out.